Product Review by Hair Loss Specialist may change the way you think about protein shakes. This delicious, easy-to-mix supplement delivers crucial protein that your body needs for your exercise routine. Plus, the gluten-free and vegan friendly formula thinks about the whole you, not just your muscle mass. Two flavours vanilla and chocolate will suit all taste pallets. Absolique Hair Health Clinic offer the Green Qi alkalizing green drink to take your supplements, where recommended, to support health, deficiencies, absorption and hair growth. Every single one of us has our own unique metabolism, so the green drink may fill us up for a varied amount of time. 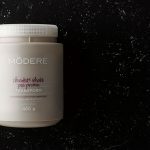 For the faster metabolism or when try to increase protein intake, Modere pea protein shakes can be added to your green drink for added flavour and protein. Many causes of hair loss and poor hair growth stem from low iron, low ferritin and moving iron studies. This can in turn effect appetite, digestion and absorption. Adding a safe protein to your green drink can increase your protein intake while assisting to overcome the green taste that naturally comes with a health green drink. Please don’t think any protein powder is a replacement for your iron supplements nor does it replace a healthy diet. Modere products are tested to make sure they never contain any harmful ingredients which is why we choose to use and recommend Modere nutritional and safe home products. Gluten free and vegan friendly, this could be your new protein powder to use when you need that little bit extra.